Businesses are always expanding. As every business grows, security on property becomes an issue. Space can often keep businesses from adding the security features they need to protect their assets. Rather than make room in your already busy main building, use a modular guard booth to give your security team the space they need to work. There are several security booth options available to help your company get exactly what they need. Panel Built has plenty of experience creating quality guard shacks for industrial and commercial businesses. The biggest benefit of a guard house is enhanced security. In fact, just having a portable guard house on property can help deter criminal activities. Your staff will feel safer when entering the property because it is able to be monitored more effectively. Portability is important when trying to plan a layout. Panel Built guard booths are all pre-assembled modular buildings. This means that your guard house can be moved as your needs change. Many companies that work on several different locations each year invest in a portable guard house by Panel Built because of its flexibility. Another major benefit of a Panel Built security booth is that there is no construction mess involved. 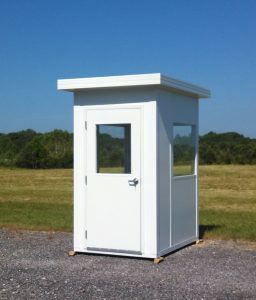 Guard houses are assembled by professionals in their facility and then shipped directly to your work site. Once it arrives, you can use it right away. No temporary hard hat zone is required! A modular guard house can also become a permanent addition to your main building. The pre-assembled buildings can easily be placed inside of a factory or warehouse. If a strong mezzanine is in place, your guard house can be placed on a higher level, freeing up space on the ground floor. There are a lot of location possibilities when it comes to prefabricated guard houses. A prefabricated guard house can be created in many different ways. The exteriors and interiors are highly customizable. Panel Built has access to the latest technology and high-quality supplies to give the guard houses unique features that match the theme of your operation. Like most modular buildings, security booths can look like anything from a plain box to a small house. A number of different window and door styles will compliment the exterior colors. This makes it easy to match your modular guard house to the rest of your property and get an all-around professional look. Choosing a design may seem difficult, but when you contact Panel Built, an experienced professional will be able to help you decide. After listening to the needs of your business, they can make accurate suggestions about the design and layout of your guard booth. Many businesses want their guard booths to look unique, but also want them to stay looking professional. Some businesses only need the booth on a temporary basis and are concerned about resale value. Even if the booth is given a distinct design, it can always be remodeled when sold. Because of this, businesses can feel confident when choosing designs and pick something that is unique to their property. Prefabricated guard houses are a great way to expand your property. Because they are treated for weather resistance, they are a lasting investment that can save a company a lot of money. Fully customized designs allow you to get the layout and size your business needs to improve efficiency. Whether you are placing your portable guard house in an unused parking lot or adding it to an internal mezzanine, your business deserves only the best quality available. Panel Built has experience working with a number of different security teams to help them discover features that benefit them. Some teams, for example, may need a larger space than initially anticipated because they want to add a personal office space or bathroom to the booth. The modular design is very convenient and flexible, so there are a lot of options that teams don’t normally think about. Panel Built also has experience constructing all building sizes. Not every modular building is as small as a standard security booth. Because many customers are eager to expand, they often call Panel Built to help them add to their booths or modular offices later on. With a team of experts manufacturing the guard house, businesses are able to get the best designs available. Whether the booth needs a sliding teller window, glass door or extra-large windows, the design team at Panel Built can help. Not only does Panel Built have the skills to help your business expand, they are able to create stellar booths in as little as two days. Their fast shipping program allows you to have access to your booth much faster than other companies. The quick team still pays very close attention to details during the manufacturing phases, so businesses still get the high quality that Panel Built is well-known for. 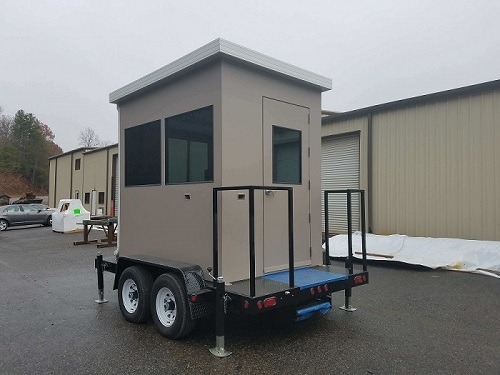 Contacting an experienced company like Panel Built is the first step in getting a portable guard booth that you can be proud to call your own. An experienced customer service representative will be happy to provide you with more information on guard booths and how they can help your business. To add a prefabricated guard booth to your property, contact Panel Built today.